Sound design is both an art and a science, because how does one track and control something you can’t see? To help make better sense of sound insulation, certain ratings have been developed to indicate a material’s ability to absorb sound. While these do not replace the expert insight of an acoustics professional, they make it somewhat easier to select the right acoustic partition or to decide on an appropriate acoustic treatment to isolate sound in a space. The key is to interpret the sound ratings correctly and to understand the corresponding effect on sound. The sound ratings related to sound insulation determine the absorption of a material, and those with higher ratings will be better at absorbing sound than ones with lower ratings. It is important, though, to distinguish between sound diffusion and sound insulation challenges. Diffusion refers to how sound is scattered in a space to make it easier on the ear. A noisy restaurant, where the sound of voices shouldn’t dominate the room, is an example of a diffusion challenge. Insulation, in turn, is all about stopping sounds from leaving a space or from leaking into a space, such as a busy canteen next to a boardroom. The ratings discussed in this article are specifically focused on the latter – sound insulation. Two critical elements that are considered when determining the ratings of any specific material’s sound absorption qualities are frequency and decibels. Decibels (dB) indicate how loud the sound is – the more decibels, the taller the wave and the louder the volume. Frequency, which is measured in hertz (Hz), refers to the pitch of the sound and is determined by how quickly sound waves follow on each other. Loud, low-frequency sounds such as bass music at a club would be tall waves that follow each other relatively slowly, while a whistle is a high-frequency sound that creates tall waves that follow in quick succession. Low-frequency sounds typically travel further and last longer than high-frequency sounds. A sound transmission class (STC) rating is a United States standard and the higher the number, the better the material’s ability to reduce sound by reducing both the frequency and decibels. A standard material such as glass has an STC of about 20s, while the average wall has an STC of 30s. Effective sound insulation, however, starts at about 50s. Also note that STC testing standards are continuously updated, so an STC rating from two decades ago won’t be the same as that same rating today. The one downside of the STC rating is that it doesn’t cover low frequencies very well. A material can have a high STC number, but not really block sounds such as rumbling traffic, reverberating construction or the droning hubbub of office voices. Rw is an alternative to STC and used by most of the world. It is an International Organisation for Standardisation (ISO) rating and part of the ISO 140 (Acoustic) family. Rw ratings are similar to STC in that they follow familiar testing methods. The difference comes in the fact that Rw covers a much larger frequency range than STC. Therefore one can’t simply compare an Rw rating to an STC rating. STC values are typically about three to four decibels higher for the equivalent sound insulation in Rw (47dB STC = 44dB Rw). Some professionals prefer Rw because it corresponds to the decibel scale, so an Rw 50 rating means that one could expect the rated material to reduce the unwanted noise by 50 decibels. STC is often quoted in online literature about acoustic solutions. However, this has more to do with the overwhelming presence of US-based companies online and is not due to any perceived superiority. In fact, STC can be a bit hard to comprehend at face value. Rw, on the other hand, works in tandem with the decibel scale, so if one can determine the decibels of the unwanted sound, one can get a good sense of what Rw level is required in an acoustic partition to reduce the sound. International standards that dictate Rw also make it easier to be in line with global compliance and green credentials. Full thanks and acknowledgement are given to Aluglass Bautech for the information given to write this article. 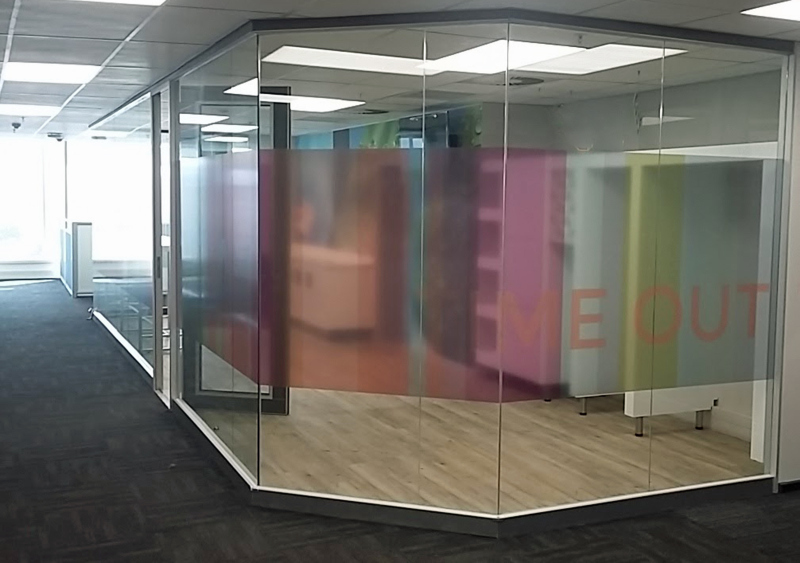 Caption main image: Acoustic glazing used to partition spaces in an office environment.